The Electrical Water Pageant is a nightly light display that sails around Seven Seas Lagoon and Bay Lake. It can be seen from the entrance of the Magic Kingdom, as well as the beaches of the surrounding resorts. It’s a tradition for many families to watch it year after year — even if it considered “old school” by some. Here are five things you may not know about this longtime favorite. The Electrical Water Pageant debuted on October 25, 1971, just 25 days after the Magic Kingdom first opened its gates. This day was known as “dedication day” and was filmed by Walt Disney Productions. It turned into an episode of “The Wonderful World of Disney” that aired on NBC four days later. This effectively makes the Electrical Water Pageant the oldest parade at Disney! Hey, she’s looking pretty good for almost 50 years old! Not only is the Electrical Water Pageant the oldest parade at Disney, some of the floats are actually the originals that debuted in 1971! Two of these originals include the whale and turtle seen above here — the octopus was actually updated in 1972 (so close, little guy!). Other originals include the jumping dolphins (three floats), four seahorses, and King Neptune who oversees the entire production. King Neptune and his seahorses… and the croc! The 14 floats of the Electrical Water Pageant are lit up by more than 50,000 lights! Disney has to replace hundreds of bulbs a week to keep the show sparkling. Additionally, the Pageant is made up of two barges, each with seven connecting floats. The barges are more than 40 feet in length and 25 feet tall! Instead of commissioning a completely new piece of music, Disney purchased the rights to Gershon Kingsley & Jean-Jacques Perrey’s “Baroque Hoedown.” They then had musician Paul Beaver, who was known for helping pioneer the moog synthesizer, remake a new version of the song. Beaver also worked on The Beatles’ Magical Mystery Tour album, as well as created many of the sound effects for the original Star Trek series. In 1977, yet another version of “Baroque Hoedown” was being used in the Main Street Electrical Parade, so to avoid confusion, they stopped using it during the Electrical Water Pageant. The music switched to the format still used today — where each floats has its own soundtrack. The musical lineup you hear today has been the same since 1996. Click here to read more about the music of the Main Street Electrical Parade and the Electrical Water Pageant. It takes only five people to run the show each night. There is a safety boat operator, two pilots who sit in the first float of each barge, and two co-pilots who sit in the last float of each barge. The show starts immediately when the crew is in position, so a change in wind doesn’t derail the floats’ set-up. Using a carefully designed system of lights and music cues, the co-pilots must manually flip each light switch at the right time. No pressure! Read more about the history of this nostalgic favorite by clicking here. 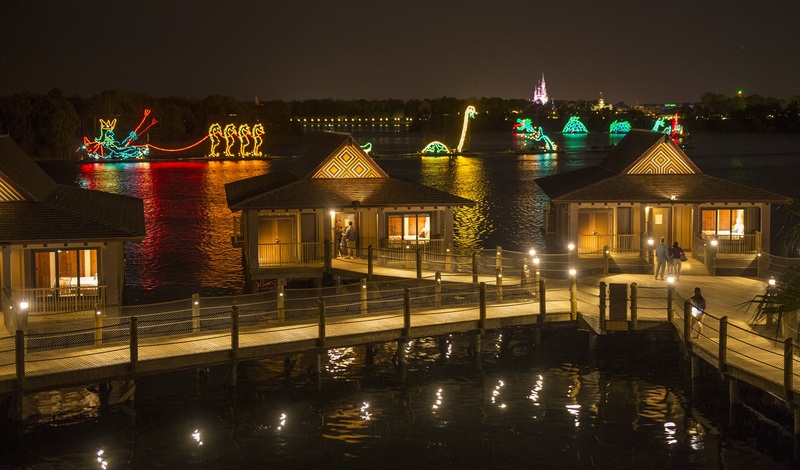 Is the Electrical Water Pageant a must-see on your Disney vacation? Let us know in the comments!